Cheesecake Stuffed Strawberries are the perfect no-bake treat! 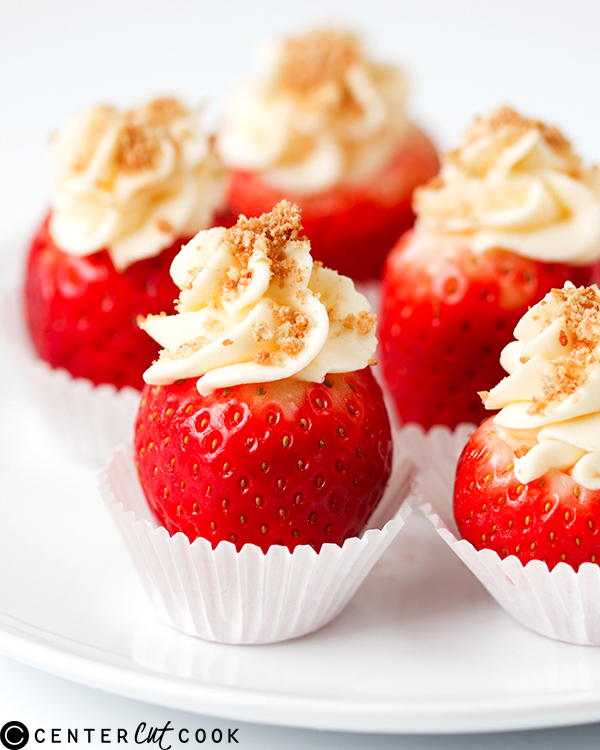 Juicy strawberries stuffed with delicious cheesecake filling are the ultimate indulgence! Dip them in Chocolate to take them to a whole new level! My love for cheesecake happened long before The Cheesecake Factory was even a thing. I remember my mom making classic cheesecake with strawberry topping for Sunday night dessert and it was always a favorite. There was one particular episode of Paula Dean on The Food Network where she was stuffing strawberries with cheesecake and I thought it was an incredible idea. I love to stuff lots of things with cheesecake filling — especially my cheesecake stuffed french toast. If you haven’t had it yet, you must! Cream cheese stuffed cookies, apples, cupcakes, you name it, cheesecake can be stuffed into just about anything and taste amazing. The concept for these no-bake Cheesecake Strawberries is super simple. You’ll start with large, juicy, beautiful strawberries. I like to slice the bottoms off of the strawberries so that they stand up better. The cheesecake filling is made very simply with heavy cream, cream cheese, confectioners’ sugar and a little bit of vanilla extract. You’ll pipe the filling right into each strawberry then top with graham cracker crumbs for a delicious treat that is perfect for summer, perfect for valentine’s day, and really, perfect for just about any occasion. If you don’t have a piping bag, just use a ziplock/plastic bag, spoon the filling into the bag, then cut the tip and squeeze filling into each strawberry. It works just as well! 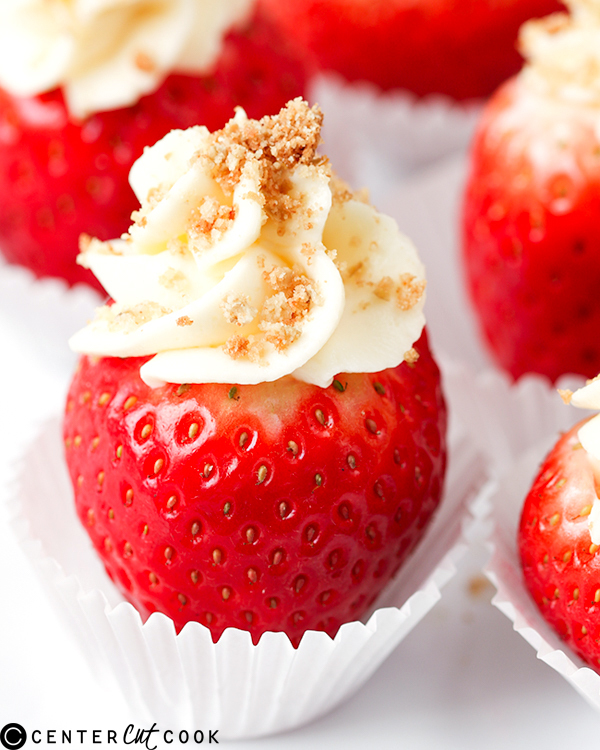 Cheesecake Stuffed Strawberries make a beautiful treat for showers and weddings. And you can take it up a notch and dip the bottoms in melted chocolate, if you wish (not shown here). Cheesecake Stuffed Strawberries dipped in chocolate, need I say more? These strawberries are delicious and beautiful! You can make this recipe low-carb/keto by substituting the confectioners’ sugar with something like Swerve Confectioners. It’s a zero-calorie sweetener, and my personal favorite. Feel free to make these ahead of time, but wait to sprinkle the graham cracker crumbs until right before serving so that they don’t get soft and mushy. 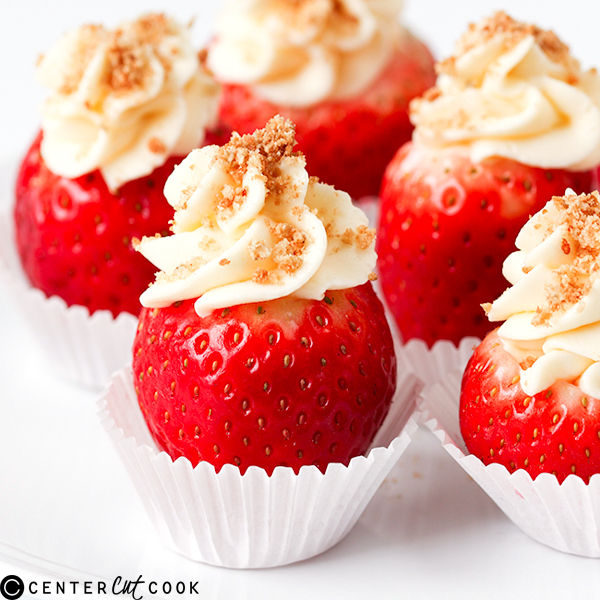 We love these Cheesecake Stuffed Strawberries and I think you will too. Cut the leaves off of the strawberry, then use a melon baller to scoop out the center of the strawberries. Slice the bottom off the strawberries so they stand up. Place the cream in a large bowl and whisk until soft peaks form. Add in the cream cheese and whisk again for a few seconds to combine, then add in the confectioners’ sugar and vanilla extract. Whisk again for a few seconds until the mixture is light and fluffy. Spoon the mixture into a piping bag with a fluted tip and pipe the cheesecake mixture into the strawberries so it fills the hole. Keep piping until you have a little mound of cheesecake filling on top of the strawberries. Place each strawberry in a petit fours case on a large plate or tray. Crush the crackers by placing them in a bag and using a rolling pin to bash them into crumbs. Sprinkle crumbs on each of the strawberries before serving.